The new Aston Martin Vanquish has been touring the States and Canada since August, when it was first presented to the American public at the Monterey Car week. The Vanquish will also be displayed at the 2012 Los Angeles Auto Show, which will open its doors on the 28th November until the 9th December, before heading to showrooms at the beginning of 2013. The charming British car uses 75% of new components, but also features some revised elements sourced from the manufacturer's range, such as the powerful 6.0-litre V12 engine that equips the DBS, boosted for the occasion in order to produce an extra 55 hp, reaching a total of 565 hp and 620 Nm of torque. The naturally aspirated petrol engine, mated to a “Touchtronic 2” six-speed automatic transmission, offers impressive performance figures: the Aston Martin Vanquish can cover the 0-100 km / h in just 4.1 seconds, reaching a maximum speed of 295 km / h. Thanks to the Adaptive Damping System the driver can quickly switch between three damping modes, Normal, Track and Sport, which adjust the handling characteristics of the car. To achieve such high performance in total safety, Aston Martin has installed the third generation Brembo Carbon Ceramic Matrix brake system, which uses 398 mm x 36 mm brake discs and six-piston calliper (from the One-77) for the front and 360 mm x 32 mm brake discs with a four-piston calliper at the rear. 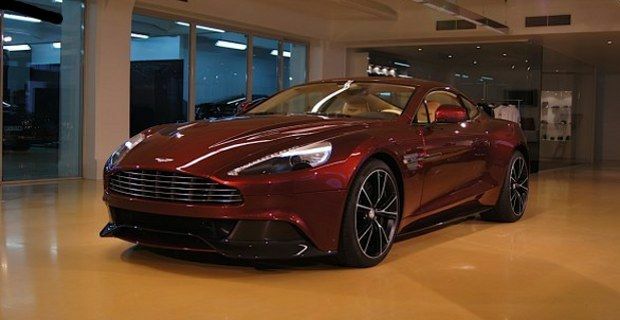 The Vanquish measures 4720 mm in length, 2067 mm in width, 1294 mm in height and has a 2,740 mm long wheelbase. The new Gaydon-born coupé results much lighter than its predecessors: the total mass is 55 kg less than the DBS and the car weights just 1,739 Kg. Thanks to the extensive use of carbon fibre and other fine materials the car has improved not just performance, but also handling and sports dynamics. The torsional rigidity has also been increased by 25%. Aston Martin Vanquish can be chosen with either 2+0 or 2 +2 seating configurations.